When it comes to your finances, it can seem like all the advice you get is deadly boring, unbearably abstract or both. For example, when it comes to paying off debts, how can you be expected to make a dent without first having a spreadsheet that compares all your credit cards and loans with columns for principal, interest rate, fees and maybe even frequent flyer miles? It’s intense. At the same time, when it comes to spending, you’re no better off. How do you compare the value of a fancy dinner to buying a new outfit for the kids? In 1986, The Economist created “The Big Mac Index” as a way to compare currency values across eras and national borders. The index shows how many hours of labor it takes to earn the cost of a Big Mac. So, if it took you 10 minutes to earn the cost of a Big Mac last year and it takes you nine minutes today, you are – in theory – better off than you were before. That’s true whether those gains come from getting a raise, moving to a town with a lower cost of living or improvements in McDonald’s supply chain to save consumers money. While the value of a dollar changes over time, the value of a Big Mac to a hungry customer remains constant. We’re going to use the same Big Mac concept here, but we’ll use it to explain personal finance. If you’re a fan of Apple products, fabulous. If not, feel free to substitute other luxury goods of your choosing. As an added benefit, if you’re looking to talk about money with a young person, you may find the Apple index to be a helpful tool for starting a conversation. After all, that young person is probably staring at their phone, tablet or laptop right now. If you’re carrying an iPhone, it’s probably the most expensive thing you carry every day. You might not think so, because you might be used to those two-year contracts that artificially decrease the price of a phone by several hundred dollars. In reality, though, a lot of companies, from your service provider to the handset manufacturer, stand to make money by concealing the price from consumers. Even then, you could be skeptical. “After all,” you might say, “I’m currently wearing a very expensive watch. This Omega Speedmaster Moonwatch is the same model as the one that’s been on the moon.” Or maybe you’re glancing at your Hermès Clemence Birkin purse, believing no phone could cost as much as a bag for which a noble alligator gave its life. Actually, it does. You see, when a person buys a luxury watch, he or she usually expects to hand it down to their son, daughter or whomever so they may stay in a family for generations. The same is true for Hermes bags, particularly because they have to last long enough to get back to the top of the waiting list. A Hermes reservation can last a family for generations, too. A $10,000 watch or bag that lasts 100 years actually costs $100 per year. Similarly, a basic two-year phone contract typically came with a $200 credit toward a phone purchase, so even a free phone on that plan costs $100 per year, the same as an Omega watch or Hermes bag. A $649 iPhone 6s costs more than three times that much. Most phones sold this year don’t have 2-year plans. Instead, AT&T, Verizon and many of their competitors offer plans that can be canceled at any time, with the cost of the phone spread over two years or more, disguising the total price of the product. After all, the difference between spending $25 per month and $30 per month seems negligible. If you’re already writing a check to your service provider for $200 worth of data, talk, taxes and fees every month, what’s another five bucks, right? Of course, that difference over two years comes out to $120. If you have three lines on your account, the bill comes to $360. When are you planning on paying off that smartphone? When do you expect to not have to pay another phone bill? The smartphone manufacturers assume a two-year lifecycle, and intentionally do not design their phones to last forever. Five years ago, one of the best selling phones was the original Motorola Droid. Go back another year, and it’s Nokia at the very top of the sales charts, capping over a decade of the company’s dominance. It’s hard to remember that environment, but it included 3G networks and sliding keyboards. Phones have short shelf-lives, so you can probably expect to make payments on a phone for most of the rest of your life. If you made that $5 payment into your savings account instead, that would be around $16,000 in time for your retirement. That’s an expensive five bucks. It’s not a Big Mac, but hopefully the iPhone works just as well to explain the value of money when it’s difficult to understand. Buying a product that lasts a lifetime can actually be quite affordable in the long run. On the other hand, a mindlessly squandered five dollars can be quite expensive. 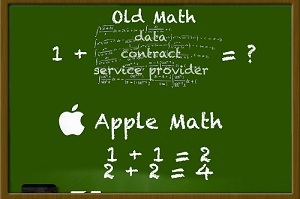 We’ve got a lot more lessons from the Apple index coming up, so stay tuned!